Magic: The Gathering Arena is Wizards of the Coast’s competitor to games like Hearthstone and Gwent. It is a digital card game experience that’s meant to capture all of the great parts of Magic, making them accessible without losing any of the complexity that makes Magic such a rewarding game to play. If you’ve ever played the game, you might imagine that this is a difficult balance to strike because Magic is complicated. To play the game at its highest levels, there are dozens of rules that you need to be familiar with, including things like the mysterious “layers” system. The question, then, is if Arena can do it. Does it work? In short: yes. I’ve been playing Magic for about ten years now, and what you play in Arena is that very same game. Distinct from products like Magic Duels, a digital implementation of the game that was clunky and confusing to play, Arena puts the game in a very approachable framework that looks a lot like Hearthstone. You have a deck, a graveyard, a battlefield, and a hand, and the game moves through turn phases just like it does if you play it physically. 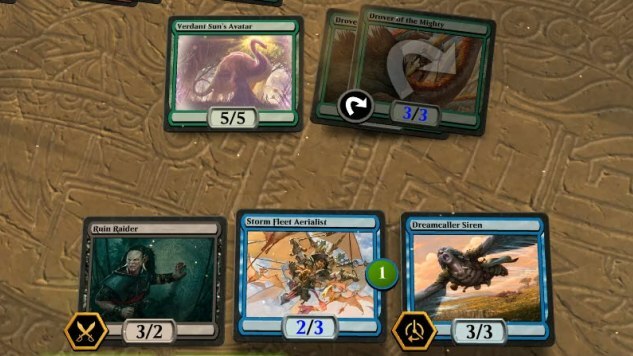 If you’ve ever played a game of Magic and are looking for that in digital form, Arena is going to allow for that. The most crucial aspect of the game is in how it manages “triggers.” Magic is turning 25 this year, and something central to its design is how to manage lots of things happening at once. Any card that has an “if” or a “when” in its rules text contains a triggered ability, and if you peruse through some cards you’ll see that lots and lots of cards in the game have this text. In the machinery of the game’s rules, this means that an ability goes on the “stack,” a way of managing the order of operations in the game. For example, if I cast a creature spell, and my opponent has a card that says “when an opponent casts a creature spell, draw a card” on it, then that ability triggers. My creature spell is in a kind of rules-lawyer waiting room, and the opponent’s “draw a card” trigger goes on top of it. If I had an instant or ability to do in response, I could then put those on the stack to respond to that card draw. This is complicated, and we’re deep in the rules, but I’m writing that horrible rat’s nest of rules and ideas because this is the exact problem that Arena has to solve. Making this entire system of spells, their resolution, and responses clear and clean is visually very difficult. Magic Online, Wizards’ current digital offering that offers a complete replication of the paper experience in a digital way, is terrible when it comes to managing triggers, spells and responses. You basically have to become fluent in the platform and its mechanisms before you can begin to play, and that’s a problem for new players. From my few hours with Arena so far, I can say that they have made this trigger system clear and useful. I know what phase of the game I am in, I know what triggers and spells are targeting what players and creatures, and it all seems to come together in the actual play of the game. While it can still get hectic, Arena does about as good a job as possible at showing you what’s happening, why it is happening, and what the effect is going to be. This is the hardest problem to crack in digital Magic, so I have a lot of faith that the final product is really going to be something special that I’m going to be playing for a long time. Arena is currently in closed beta, with release coming sometime in the future. You can sign up for the closed beta here.